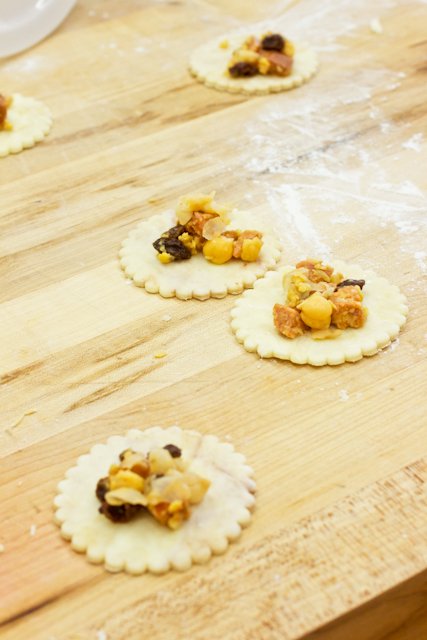 Clearly, one of the best parts of taking classes at King Arthur Flour is the opportunity to learn all kinds of baking tips and tricks. I’ll talk more about this in a future post, but part of our 3rd day at Blog & Bake was dedicated to learning how to make pie dough. And whether you make yours in a food processor or stand mixer (and especially those of you who still buy your pie dough – for shame! ), you should know that making pie dough by hand is really the only way to really know how it should turn out. 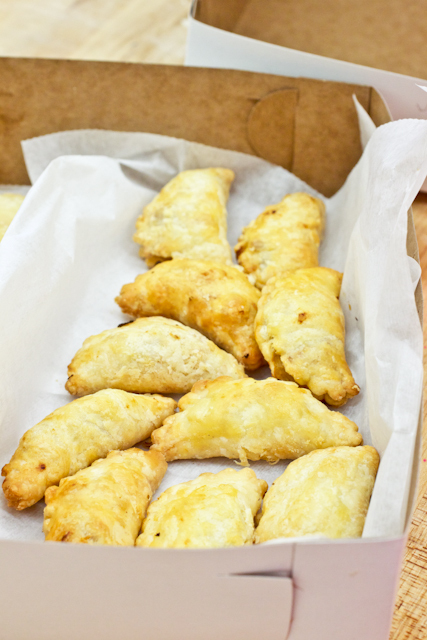 These spicy chickpea and chorizo empanadas were the end-products of our handmade pie dough speed class and I’ve been dying to share this recipe with you ever since making them! Honestly, it was the first time I had used lard (or shortening) in pie dough and while I held my breath with uncertain expectations, I am now a total convert. And if you follow Megan’s blog, Stetted, she may tell you about her pie dough made with all lard (no butter); I wasn’t that brave. And as much as I fell for the whole wheat cinnamon raisin scones, I think these empanadas were my true favorite of the event. Big hunks of lard and butter are left scattered throughout the empanada dough in order to create a gorgeously flaky final product and the best way to really achieve this is to make the dough by hand so you have total control over how you work the fats into the flour. Important stuff, people. The chickpea and chorizo filling is a cinch to throw together (maybe 5 minutes of your time) and it is just awesome – smoky, hearty, and just a little sweet from the unexpected addition of raisins. I’ll admit to adding a little cinnamon to the dough which swirled its way in as I was mixing and the flavor just blossomed in the dough as the empanadas baked; a nice little chance I took there, if I do say so. So…pie dough by hand? The antithesis to worrying about warming the butter? Have no fear and trust the experts (King Arthur Flour, that is) because this recipe works perfectly! You should also know that this pie dough recipe is fabulous for sweet creations too, aside from pie of course, and my bench partner for the afternoon, Carrie of Bakeaholic Mama, made some outstanding cinnamon-sugar pop tarts with her batch of dough. We swapped half of her pop tarts for half of my empanadas and I couldn’t have been happier with how versatile this dough is – dinner and dessert from one recipe! 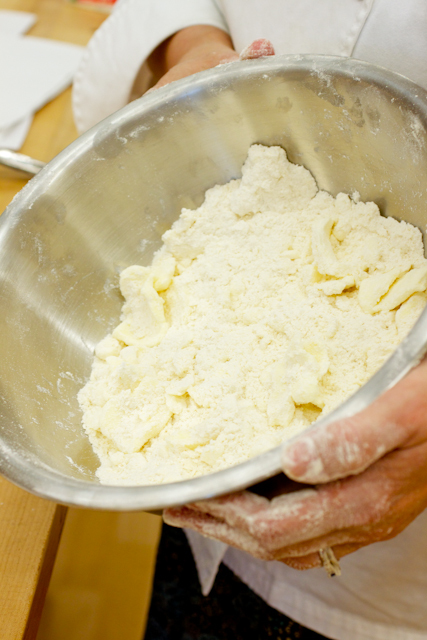 To make the pie dough: Combine the flour and salt in a mixing bowl. Cut in the lard with a pastry blender or quickly with your fingers until the lard is about the size of raisins. Quickly cut in the butter with your fingers. Because the butter will be harder than the lard, coat all of the butter pieces with flour and work the pieces into the dough between your fingers until they are about the size of dimes, with a slightly flattened shape. Sprinkle 2 tbsp of the water into the flour mixture and mix just until the dough begins to form a mass, adding up to 2 more tbsp if the mixture is very dry. Turn the dough mass out on to a well-floured work surface and gently press it together into a flattened disk, about 6 inches in diameter. Wrap the dough in plastic and refrigerate for at least 20 minutes. To make the filling: In a small bowl, combine the mashed chickpeas, chorizo, salt, and spices. Stir in the broth and raisins until the mixture comes together; set aside. Once the dough has chilled, lightly flour a rolling pin and the work surface and roll the pie dough out to 1/8-inch thick, working from the center of the dough out to the edges. If the dough is too cold to roll, cover it lightly with the plastic wrap and let it sit at room temperature for a few minutes until it is pliable but not soft or warm. Using a 4-inch round cookie or biscuit cutter, cut out circles from the dough, rerolling the scraps and cutting out more circles. The dough should yield approximately 18 circles. Spoon 1 tsp of the filling into the center of each dough circle and fold the dough over into a half-moon/semi-circle shape. 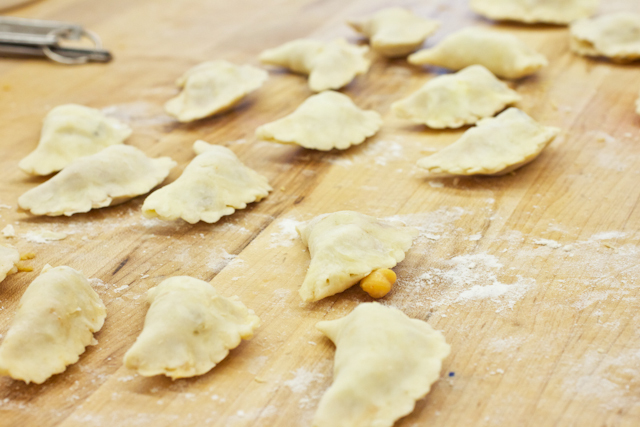 With your fingers, press the edges of the dough together to seal the filling in. Place the empanadas on the baking sheet, about 1 inch apart, and brush the tops with the egg wash. Bake for 20-30 minutes, until the empanadas are golden brown. Wow, these look fabulous! Ican’t wait to try them with a nice salad. Thanks! I have been dreaming of these empanadas since I left KAF. I think I need to make them soon! I love your adventurousness, throwing cinnamon into the dough! I regret that I did not get to sample any of the empanadas – will have to pull out the recipe and make some for myself! Thanks for baking with us. I have yet to try making empanadas, but I sure like eating them, so it’s probably time that I tried! Very glad to see this empanadas post with photos. My friend Al went to the very same class as you and sent me the recipe. Fun class I bet.